Certain artists can really sneak up on you—and I mean that in multiple ways. Sometimes it’s that a guy has been making music for years, you’ve never heard of him, and suddenly he bursts on to the scene with a chart-topper. It can also mean you’ve heard their music in passing, but outside of the car, you had no idea they’ve sold tens of millions of records. Today’s artist ticks both of those sneaky boxes. John Clayton Mayer was born on October 16th, 1977 in Bridgeport, Connecticut. He was the middle child born to a family of teachers; his mother was a middle-school English teacher and his father was a high-school principal. Fun fact: Mayer would become close friend with future tennis star James Blake while in middle school. They both were big into Nintendo, but I digress. After watching the film “Back to the Future,” he became fascinated by Marty McFly’s guitar performance and wanted to give it a shot. His father rented him a guitar to try, and a neighbor lent him his collection of blues cassette tapes. Guitar became his sole focus in life—so much so his parents took him to see a psychiatrist to make sure he didn’t have some sort of attention disorder or personality issue. Doctors couldn’t find anything and the scrutiny didn’t deter him. Mayer began joining various bands and performing solo while in high school. Mayer would go on to enroll the Berklee College of Music in Boston, however his friend would convince him to move to Atlanta and start a band. They were called the LoFi Masters and gained some traction in the Atlanta area, but Mayer’s decision to split off into a solo artist would prove to be a fruitful endeavor. 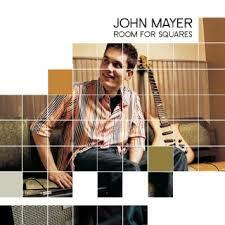 His debut album Room For Squares would be released in June of 2001. At the time, music sharing sites were incredibly popular, and Mayer would benefit from his album being one of the more shared albums of 2001. The major labels took notice to his Internet popularity, and overnight, he went from an online-only album not making much money, to being signed to Columbia Records to a mass-distribution deal. John would follow up the online fame by putting on very well-received concerts all across the U.S. To date, the album has sold over 6 million copies worldwide. Music like his was such a departure to what most people were listening to through the 90s. Bands like Coldplay or Jack Johnson suddenly found themselves at the top of all the Top 40 charts with their acoustic, pop-rock type sound. Often times, the same guys that were playing Metallica and various hip-hop also had a John Mayer album in their arsenal. There is this sort of irresistible quality to his music and his album in particular. The vocals are solid and the acoustic sound was just different at that time. It’s clear that Mayer has the chops as a songwriter too, honing in on his experiences with lost love, nearly having a heart attack, suffering from panic attacks, and having a fear he’d end up in a mental institution. It’s not the kind of music you want to listen to 24/7, but it’s a great change of pace. And over 20 million albums sold worldwide, you won’t be alone. Mayer gave up the pop scene and now tours with a Grateful Dead tribute band. Combined with some off-the-field controversies and health problems, his drift into more of obscurity may not be the worst thing. But for $5 bucks, you can go back to ’01 Mayer, and that might be the best Mayer of all time.